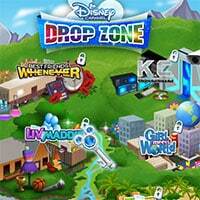 Disney Drop Zone is a wonderful match 3 puzzle game featuring characters from different Disney Channel Worlds. In this game, your goal is to finish the task and objective of each level while trying to score as many points as possible. You can choose a from a wide selection of superstars from different Disney Channels. Each superstar has their own unique mini-game that you can use when they are ready. The mini-games will help you finish the task at hand and will make you earn more points. Play some nice match 3 puzzle games with the Disney superstars. And use their unique abilities to score more points in Disney Drop Zone! Play a wide selection of mini-games and earn as much points as possible. Have fun! Disney Drop Zone Game is one of our Match 3 Games at Round Games. It is also tagged as a logic and fun game. To play even more free games, view our most played and all games pages. If you want to play more games like Disney Drop Zone Game: Then you can simply check out the games inside the game tags that are the most relevant to your interests or check the Match 3 Games category or check the related games section at the end of the game page.